The association that represents some Canadian shipbuilders says it's "surprised and disappointed" Halifax's Irving Shipbuilding Inc. and Seaspan in Vancouver are urging the Trudeau government to stall a contract previously awarded to a Quebec shipyard. The association that represents some Canadian shipbuilders says it's "surprised and disappointed" Halifax's Irving Shipbuilding Inc. is urging the Trudeau government to stall a contract previously awarded to a Quebec shipyard. Chantier Davie Canada Inc. of Lévis, Que., wants to convert a civilian cargo ship into a badly needed military supply vessel that would provide fuel, food and ammunition to Royal Canadian Navy ships at sea. CBC News reported last week that Irving Shipbuilding had sent letters to four cabinet ministers asking the new Liberal government to delay final approval of the $700-million Davie contract. The deal had been awarded by the Harper government during the federal election campaign. But the Shipbuilding Association of Canada says the supply ship deal should not be delayed. The group's membership includes Davie, but not Irving or Seaspan of Vancouver, the two largest beneficiaries of the government's $39-billion national shipbuilding procurement strategy. The organization essential scolds Irving and says neither it nor Seaspan may be able to build a supply ship fast enough to satisfy the navy's urgent requirement. "The Association strongly recommends that the government do not delay the signing of the contract for this urgent operational requirement. It has been awarded fairly," says a news release from the group. The group says Seaspan has claimed it's at "maximum capacity" and is having two ferries destined for Canadian waters built in Istanbul. And it says a JD Irving company, Atlantic Towing, is having vessels built in Galati, Romania. If the new government decides to forfeit the Davie contract, taxpayers may have to pay $89 million as a penalty. The company has already bought the ship it plans to convert. Even so, Irving Shipbuilding is asking the federal government to reconsider Irving's earlier bid to convert a roll-on/roll-off vessel into a supply ship for the navy. "We looked at a container ship which is proposed by another shipyard [Davie] and we immediately dismissed it as the wrong ship," Kevin McCoy, president of Irving Shipbuilding Inc., said Monday. "It requires too much conversion, it's too risky, too expensive and it doesn't provide the large interior payload that could be easily accessed by trucks in a humanitarian emergency such as Haiti, where I served and saw first hand." Irving says its roll-on/roll-off vessel would be capable of refueling two ships simultaneously, as well as landing helicopters and allowing large trucks and emergency response vehicles to drive on and off. "We are not interested in delaying vital, critical capability to the Royal Canadian Navy. We know they need this capability," said McCoy. "But we think we have a better, faster, less expensive alternative with much less conversion risk and bringing tremendous additional capability." 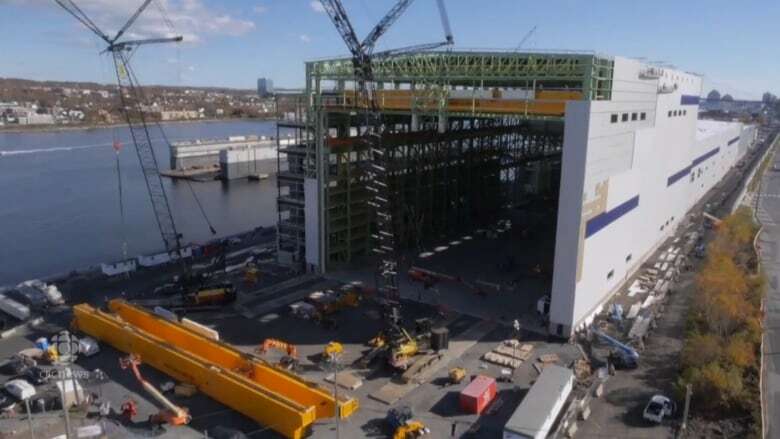 Irving Shipbuilding says four supply ships are presently being built in Romania because two years ago, when Irving won the contract, the Halifax Shipyard was undergoing a $350-million expansion and modernization to handle the next phase of the 30-year national shipbuilding contract. McCoy says with the shipyard's makeover complete and work underway on the first Arctic ship, it has plenty of capability to refit a temporary supply vessel for the navy. He questions whether the process used by the previous Harper government to award the work to Davie was ever finalized. "The government didn't come out and say, 'Here were the pros and cons of each offer, here is the cost, the schedule, and we picked that shipyard for the following reason,'" said McCoy. "That's what we are looking for and that's the reason Mr. Irving wrote the letter last week." If the Davie shipyard does get final approval from Ottawa to proceed, the shipbuilding association says the Aecon Fabco shipyard in Pictou, N.S., would benefit as subcontractor. Aecon marine is currently working on two massive tidal turbines that have been delayed and are now expected to be deployed next spring in the Bay of Fundy.